← Back to Basics…Training That Is. A few weeks ago I was awarded the honor of being the guest designer for the Wobble Wednesday Challenge sponsored by Action Wobble Challenges. That means that I got to create the challenge for the week of August 28! I chose Halloween as my theme. Halloween is my favorite holiday! And since I usually create 10 cards each holiday to send to my nieces and nephews, I enjoyed getting a jump on my Halloween card stash this year. This is what an Action Wobble Spring looks like in action. It’s fun to give it a pluck and watch it wobble! 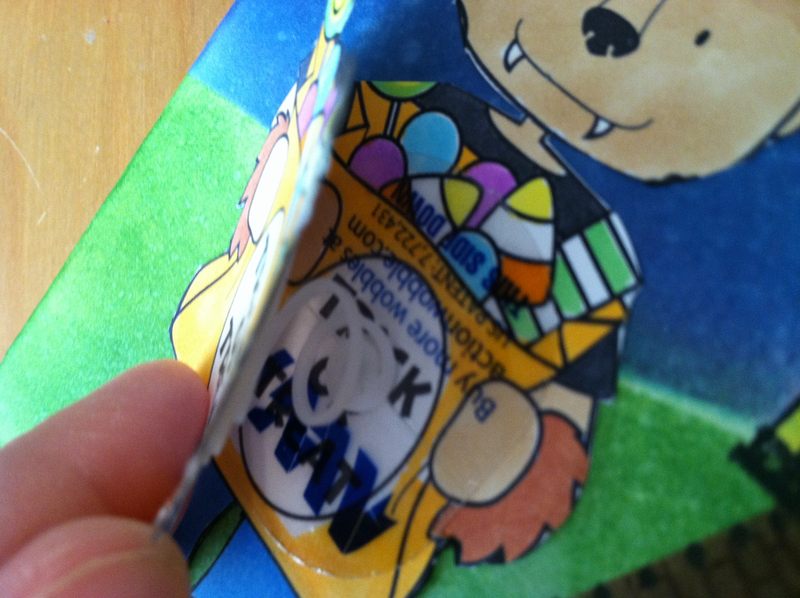 I used a free digital image from Whimsie Doodles and I printed it out twice so that I could cut out the Trick or Treat bag to be my wobble feature. The grass, the sky and the cobblestone path are all created with Tim Holtz Distress Inks. You rub them on with a foam applicator and then flick or spritz some water on them to create the speckled effect. Action Wobbles are easy to use. Just peel, stick and pluck. I purchased mine from Ellen Hutson but they are available at a variety of online stores. If you want a list of the materials I used to create this card I’ve listed them below. Action Wobble spring, Tim Holtz Distress Ink in colors, Mowed Lawn, Dusty Concord, Broken China and Vintage Photo. 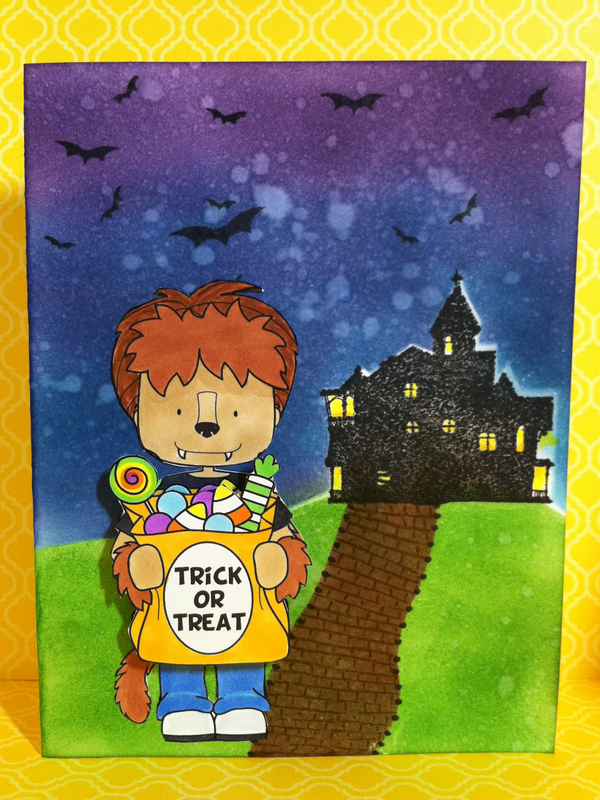 The stamps are Whimsie Doodles Wolf Boy, Hero Arts Bat Clings and Martha Stewart Clear Stamps Classic Halloween. I used various Copic Markers to color the Wolf Boy. 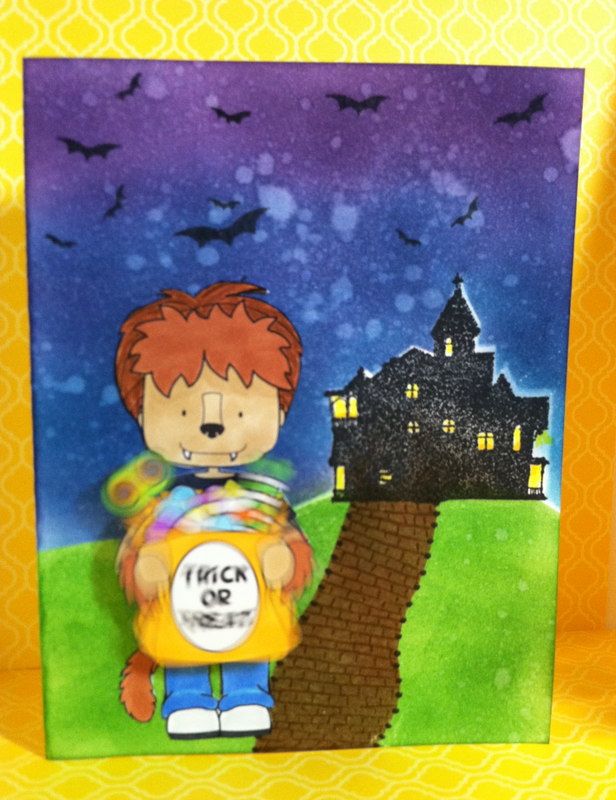 Posted in Any Occasion, Digital Stamps, Halloween cards and tagged Action Wobble card, Action Wobble Spring, Halloween card for boys, Halloween Cards for Kids, Tim Holtz Broken China, Tim Holtz Distress Inks Card, Wolf Boy, Wolf Boy Halloween, Wolfman card, Wolfman Halloween. Bookmark the permalink.